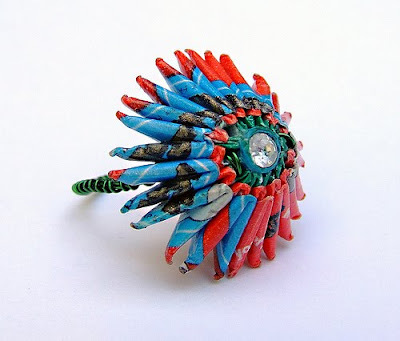 Perhaps you remember a previous post about the fab paper jewelry by British artist, Liz Hamman. 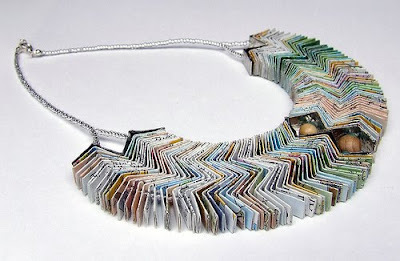 She has been busy creating new pieces.... this intriguing folded book necklace makes use of pages of an old tome - they're even placed in order. The necklace is enhanced by seed beads, wooden beads, and pewter. 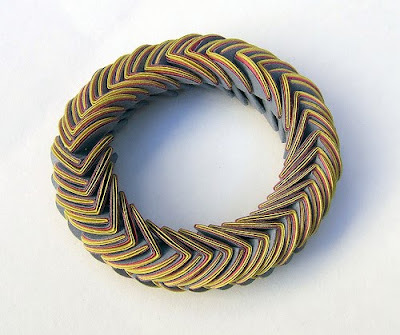 And how fascinating is the construction of this bangle prototype? I can't put my finger on why I find the piece so captivating, but it's probably the puzzle-like appearance... one that's a true challenge! Just like Liz's jewelry, her blog is well worth a look too. And her work is now available no matter where you live, via the U.K. site, Makers-Online. All of them are amazing but that third one I find truly fascinating. I don't wear accessories much, but I totally adore the bangle.. it's unique, classy and amazingly beautiful. 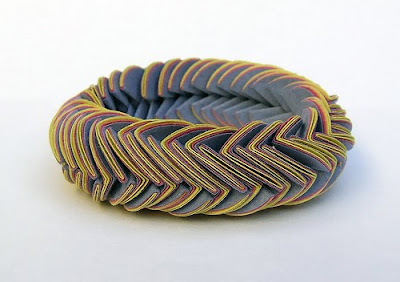 Such cool images/items - and it's paper! Wow, love that. Love paper, all things paper!